Un prénom, des intiales, une date ou un court message peuvent être ajoutés sur votre article, à l'intérieur ou à l'extérieur. Merci de renseigner "SANS" si vous ne le souhaitez pas! 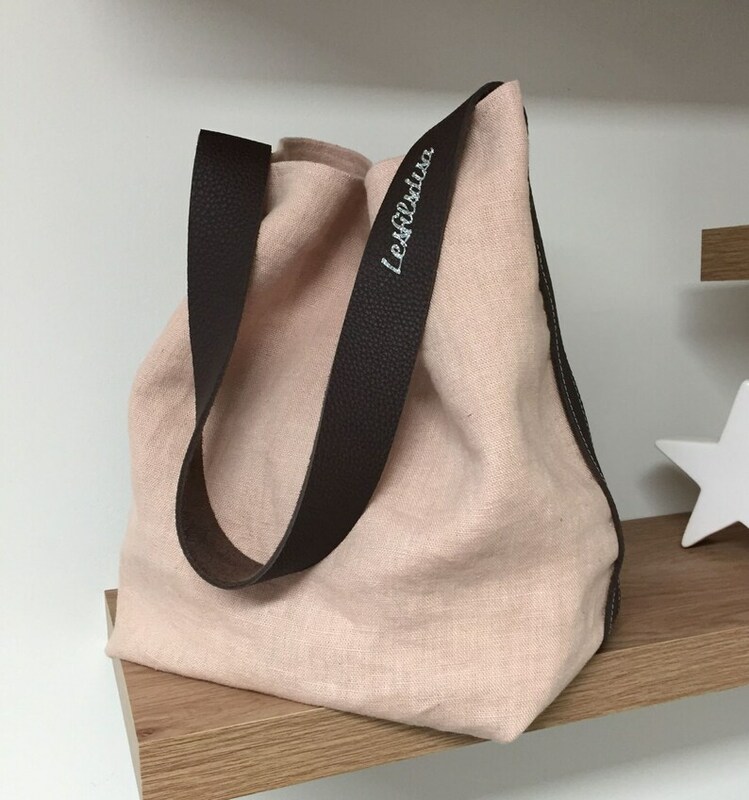 A bucket bag in pure washed pink powdered linen and leather for a sporty and chic shoulder support, with its handle in genuine chocolate brown leather, stitched. With a beautiful but lightweight capacity, this flexible bucket or bag will follow you everywhere and will be easy to carry with your outfits. Inner lining in unbleached cotton fabric. Inside patch pocket in matching powder pink linen. Many possibilities of leather colours are at your disposal: do not hesitate to let me know your wishes! Each Lesfilsdisa item is designed and manufactured in the workshop with care and attention to detail, from design to shipment. You will receive it with tracking number, well protected and nicely packaged, ready to be offered! Delivery to metropolitan France is free; flat-rate participation for the rest of the world. Parfait !! offert comme cadeau !! Je l’aurais bien gardé ! Parfait🤩 du sur mesure soigné! Réactivité d’Isabelle comme toujours ! 😍 j’adore !!! If the article does not suit you, or if you made a mistake, you have 14 days to benefit from the offer “satisfied or refunded”. You have to return the article in its packing and original condition. Refunding, except delivery fees, will be carried out under 4 days as of the reception of the product in perfect condition. This warranty does not apply to the discounted and/or customised articles. - The delivery towards the Metropolitan France is offered: delivery in "Lettre Suivie” with shipping confirmation number transmitted by e-mail. Delivery time is usually 2-3 days. - International delivery using “International Prio” letter. The shipping confirmation number is sent by email to the purchaser. * Zone 1 (European Union and Switzerland): Germany, Austria, Belgium, Bulgaria, Cyprus, Croatia, Denmark, Spain, Estonia, Finland, Greece,Hungary, Ireland, Italy, Latvia, Lithuania, Luxembourg, Malta, Netherlands, Poland, Portugal, Czech Republic, Romania, the United Kingdom, Slovakia, Slovenia, Sweden and Switzerland, (including San Marino, the Vatican and Liechtenstein; except Monaco and Andorre which are compared to the national mail). * Zone 2 (Rest of the world): other countries of Europe (except European Union and Switzerland), Africa, America, Asia and Oceania. Some articles can be customised (size, color, materials…) provided availability and of feasibility. Please do not hesitate to contact me and I will study your project very quickly!